Do you find it difficult to manage your fleet of trucks? With Doosan you can manage your fleet with ease and at no extra cost. Our Fleet Management System allows you to access real time information on a 24/7 basis, ensuring complete transparency of your fleet. You will be provided with your own login details, enabling you to have complete visibility of your fleet of trucks and their history at any time. 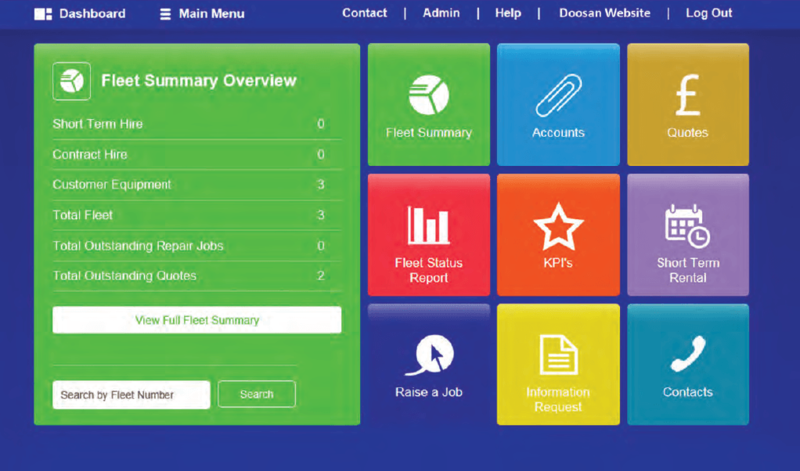 The online system allows you to view all of the information about your trucks, log breakdowns, monitor uptime and fleet utilisation, request and authorise quotes for repairs, as well as review accounts information. The fleet management system allows you to log breakdowns and request call outs online, meaning there is no longer a need to make a phone call to report a problem. Once the job has been registered online, the operations team will issue it to a mobile engineer who will then action and arrange a visit to resolve the problem. The fleet summary section allows you to monitor the progress of any issues that you have reported, providing a live indication of the estimated time of arrival of the engineer as well as an update on the status of the job. This can also be sent via email, if required. Live information is fed into the website from the engineer’s tablet whenever they visit site with all of the maintenance records being updated in real time. Bespoke reports provide essential data on customer’s equipment, including uptime, utilisation and other key performance indicators. The online system also allows you to view any outstanding invoices, view your invoice history and raise a query with regards to your account. Once your query has been registered in the system a member of the accounts team will pick it up and deal with as required.